June 25, 2008: Dr. Thomas B. Graboys appeared on ABC's "Good Morning America" in a thoughtful, yet revealing interview with Dr. Timothy Johnson. Dr. Graboys and his wife, Vicki, discussed life with Parkinson's and the effect it has had on their lives. To read about the interview, please click here. 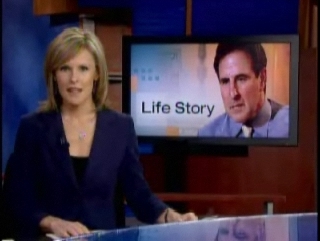 April 9, 2008: Dr. Graboys was featured in a story called "Fighting Back" on WCVB-TV's show Chronicle. Dr. Graboys was one of three people highlighted for their courageous "fight back" against adversity. He was interviewed by Dr. Tim Johnson. December 2007: WBZ-TV aired Lisa Hughes’ interview with Dr. Graboys discussing his book and life after being diagnosed with Parkinson’s.